Something took place in the gold industry that I thought would never happen. 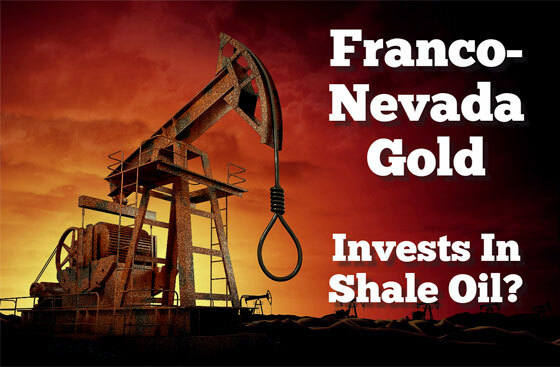 In a stunning press release, Franco-Nevada Gold announced that it was taking a financial stake in U.S. shale energy assets. Why on earth is one of the top gold royalty companies investing in an industry in which it has no expertise… especially in the shale oil industry?? When BHP Billiton began investing $50 billion in U.S. Shale assets in 2011, its profits were $23 billion that year. However, by 2016, BHP’s horrible shale portfolio helped turn its profits into a $6.3 billion loss. Franco-Nevada Corporation and Continental Resources, Inc. have agreed to enter into a strategic relationship to jointly acquire mineral rights in the SCOOP and STACK oil & gas plays of Oklahoma. Franco-Nevada is contributing approximately $220 million for the acquisition of existing mineral rights owned by a Continental subsidiary and has committed, subject to satisfaction of agreed upon development thresholds, to spend up to $100 million per year over the next three years to acquire additional mineral rights. The existing mineral rights and mineral rights to be acquired will be jointly held through a newly-formed company. In the press release, Franco-Nevada may purchase up to $100 million per year over the next three years to acquire additional mineral rights. If Franco-Nevada spends the maximum amount of $100 million per year over the next three years, they will have invested a half billion dollars in U.S. shale energy assets. However, I doubt Franco-Nevada will invest additional funds in shale energy assets when they realize that the U.S. Shale Oil and Gas Industry is the Greatest Energy Ponzi Scheme in history. If anyone knows Pierre Lassonde or the management at Franco-Nevada, please forward them this article. Well, there’s nothing like increasing one’s debt by 1,500% to produce shale oil that wasn’t economical, even at $100+ a barrel. In order to keep the Shale Energy Ponzi Scheme going, Continental Resources and many other shale energy companies have utilized a clever scheme of issuing NEW DEBT to pay back OLD DEBT. This is, of course, is the very definition of a Ponzi Scheme. We find the evidence of this by looking carefully at Continental’s financials. Now, why would Continental Resources need to issue $1 billion in new debt on Dec 4th, 2017 when the company enjoyed a nearly $800 million net income profit that year, mostly due to the Trump tax cuts?? Why? It’s a charade called “Playing the game of musical chair debt.” Continental used that $1 billion to pay back $500 million in debt and to repay the borrowings on its revolving credit facility. You see, shale oil and gas companies are doing some pretty strange accounting tricks to HOODWINK INVESTORS. While I can see this tactic fooling unsophisticated investors, I am surprised energy analysts, who should know better, haven’t raised some RED FLAGS. Chesapeake Energy, which was the United States second largest shale gas producer up until 2017, hasn’t made any positive free cash flow in the past 15 years. On top of Chesapeake’s $9 billion in long-term debt, the company continues to tap into the revolving credit facility to fund operations and payback previous borrowings from its revolving credit facility. If you look at the Chesapeake’s Cash Flow Statement above, you will see that it borrowed $6.1 billion to pay back $6.3 billion in the first six months of 2018. FOLKS… that’s a lot of borrowing and paying back. 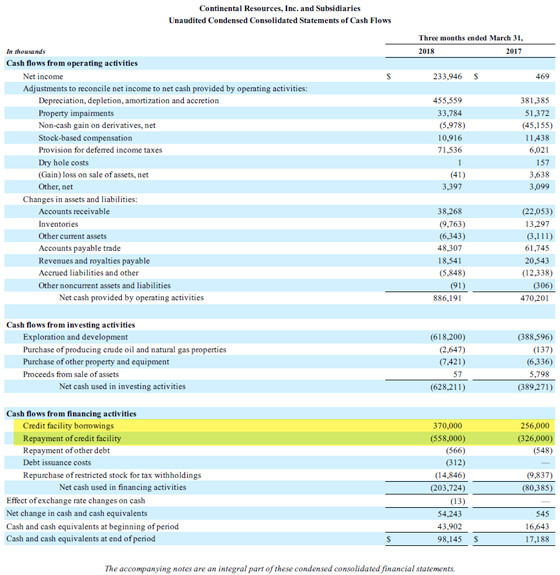 Now, if Continental is now supposedly making profits and positive free cash flow, why on earth does the company continue to tap into its revolving credit facility to fund business? 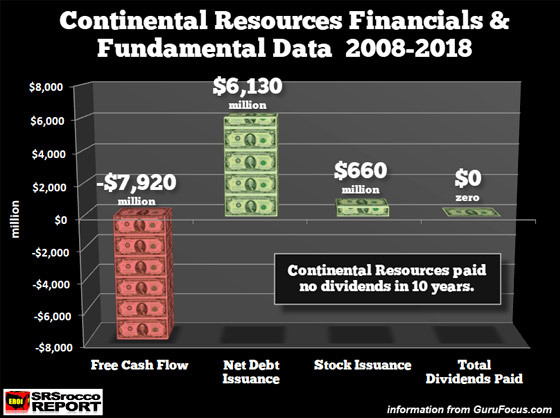 While Continental isn’t borrowing as much from its revolving credit facility as is Chesapeake, SOMETHING JUST DOESN’T ADD UP if the company is making profits and positive free cash flow. 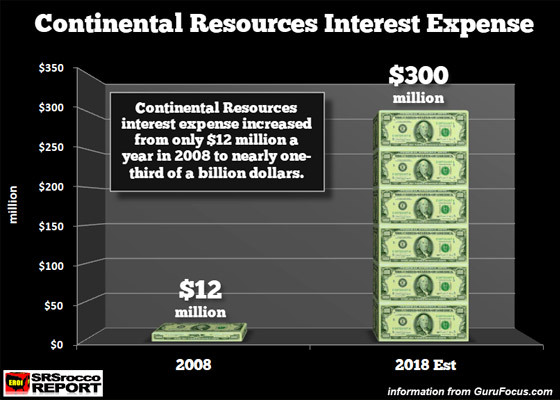 That’s correct… Continental Resources, is now paying nearly a third of a billion dollars just to service its debt. And if you think that is bad, Chesapeake Energy is forking out $425 million a year to service that $9 billion in debt… LOL. Now, if you were Franco-Nevada Chairman Pierre Lassonde, would you invest in a shale energy company with the financial results below? Continental’s net free cash flow from 2008 to 2017 is a whopping negative $7.9 billion. 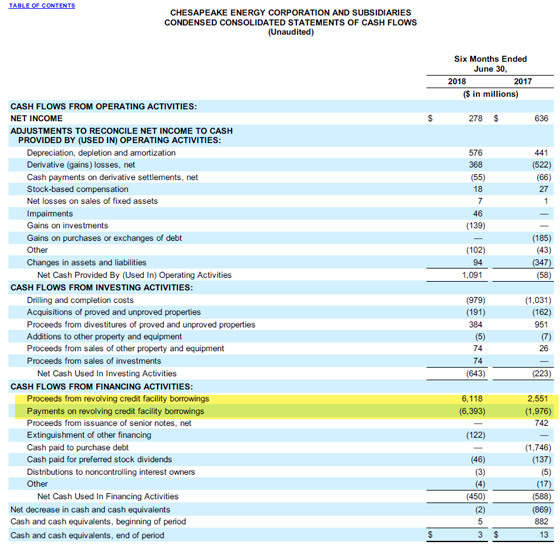 So, if the company spent $7.9 billion more to produce uneconomical shale oil and gas than it made from cash from operations, it offset it by borrowing $6.1 billion and selling $660 million in stock to investors. 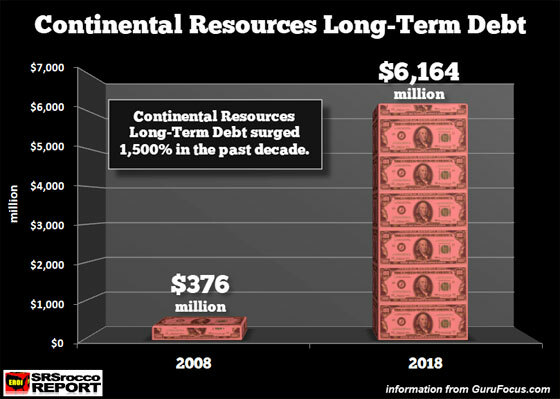 And, lastly… how has Continental Resources compensated its shareholders by going $6 billion into debt over the past decade?? You got it… it has paid out ZERO DOLLARS in dividends. So, if you think it’s NOT a good idea to own a shale energy stock that hasn’t paid one LOUSY DOLLAR in dividends in ten years, then maybe you should forward this article to Franco-Nevada Chairman Pierre Lassonde. There’s a lot more I will be writing about this new Gold Company Shale Energy Investment Fiasco, as well as more details of the U.S. Shale Energy Ponzi Scheme in upcoming articles and videos.